A few days ago, the lovely Maureen Johnson started a conversation on twitter about the dystopian genre and how it is defined. An #isitdystopia hashtag emerged. There were talks of flowcharts. 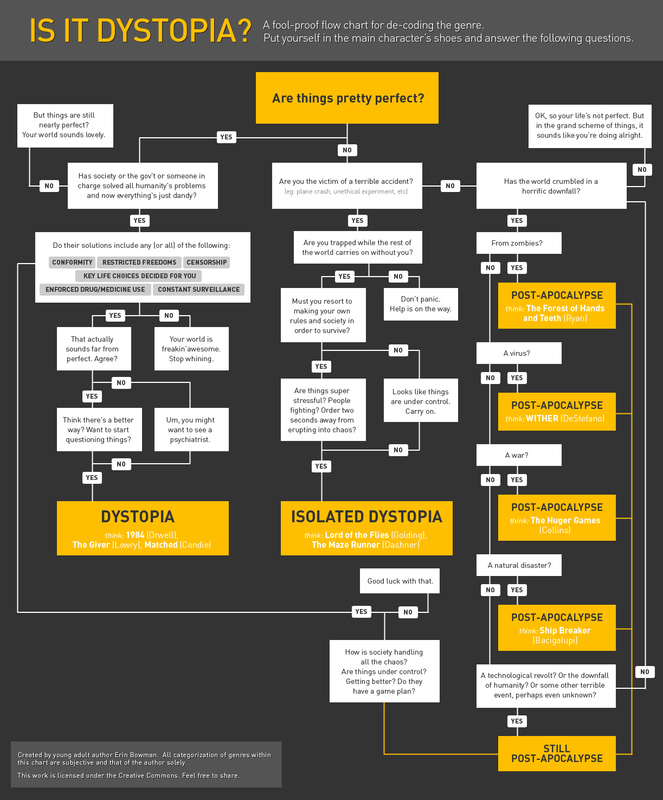 One made the rounds, and while it was amusing and had me smiling, it made me think more critically about how I define the dystopian genre. Personally, I believe that a true dystopia, at its core, has a lot to do with the main character discovering a fatal flaw in their otherwise perfect society. This means that at a book’s opening, the MC is usually blind to the injustices of their world. As readers we often see red flags off the bat, but the story becomes a journey, with the character moving from satisfied, to suspicious, to conflicted, and finally to aware, where they have some sort of realization that their world is far from perfect. Sometimes they even rebel. A good writer friend, Robison Wells recently ran a What is Dystopia 5-day series on his blog. There is some really great, insightful information in the five posts, and I tend to agree with him on almost everything. So if a dystopia is the perfect world in which the main character discovers fatal flaws, other books such as Carrie Ryan’s THE FOREST OF HANDS AND TEETH, is truly a post-apocalyptic story. Sure that book has the undertones of a dystopia – the Sisterhood is overbearing and asks citizens to blindly follow their rules – but at the end of the day, Mary knows she is not living in a perfect world. And she knows this right from the opening page. Things are BAD. And that is the key differentiator, in my opinion. A “bad” place is not all that defines a dystopia. That is not to say that a book set post-apocalypse can’t have a bit of dystopia in it. THE HUNGER GAMES is definitely part post-apocalyptic, part dystopia. So is WITHER. But both worlds rose out of a downfall of humanity. All this thinking lead to a flow-chart on my end. Is it Dystopia? A flowchart for de-coding the genre by Erin Bowman is licensed under a Creative Commons Attribution-NonCommercial-NoDerivs 3.0 Unported License. Based on a work at www.embowman.com. Feel free to share it for non-commercial uses. So what do you guys think? Agree? Disagree? I think all the confusion and blurring lines has come from the mere fact that this genre – and anything similar to it – has been flying off the shelves lately. Leave your thoughts in the comments; I’d love to hear them!